Exposed terminal posts with heavy duty 7 gauge cables provide easy access Two external 12V DC outlets to conveniently power your accessories Battery status LED indicator - Indicates the battery voltage and if you need to recharge the battery. Battery Voltage more than 12.8 volts - Green LED Battery Voltage between 12 and 12.8 volts - Yellow LED Battery Voltage less than 12 volts - Red LED The battery is charging and is fully charged - Green LED Tough heavy duty rigid polypropylene case construction Hold-down strap to secure the battery and the box to the boat Quit guessing how much battery life you have left. Our battery box has a user-friendly built-in battery meter that lights up at the touch of a button. Hooking up your trolling motor is easy. Just connect it to the external terminals - no more hassles opening the battery box until you need to replace the battery. Great for RV's, trailers, boats, just about anywhere you need auxiliary power. Features: Battery status LED indicator - Indicates the battery voltage and if you need to recharge the battery. - Battery is fully charged - voltage more than 12.8 volts - Green LED - Battery voltage between 12 and 12.8 volts - Yellow LED - Battery voltage less than 12 volts - Red LED Two external 12 volt DC auxiliary power ports, cigarette adapter plugs, allow the use of common DC powered accessories. Automatic resetting 15 amp thermal circuit breakers included External Positive and Negative terminals with heavy duty 7 gauge cables. 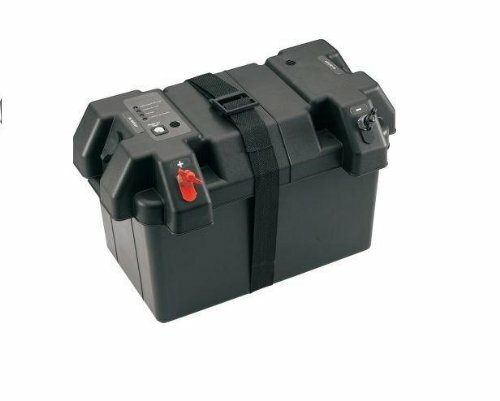 Use or charge your battery with-out opening your Marine Smart Box, Easy access for all your accessories. Hold down strap to secure the battery and box where needed. Tough heavy duty rigid polypropylene case construction. Accepts 24- and 27-series batteries. Dimensions: 16"L x 9-1/2"W x 10"H.
Our battery box has a user-friendly built-in battery meter that lights up at the touch of a button. Great for RV's, trailers, boats, just about anywhere you need auxiliary power. Battery status LED indicator - Indicates the battery voltage and if you need to recharge the battery. If you have any questions about this product by BatteryJack inc., contact us by completing and submitting the form below. If you are looking for a specif part number, please include it with your message.